Asia Ford finished the Rodes City Run in Louisville, Kentucky, in last place, but to her it’s one of her biggest wins. Ford set out on the 10K with one goal in mind, to complete the race no matter what, reports WHAS 11. After struggling with her weight for years, the mom has been making a concerted effort to shed pounds. Her weight loss journey was kickstarted after her husband lost a limb to diabetes and she began to worry about what her kids would do if her health started to fail. “That is when I woke up and I couldn’t allow them to be on this earth without my help and the only way I would be able to help them is if I helped myself first,” she said. This determination led Ford – who at her heaviest was 474 lbs., to change her diet, join a exercise boot camp with friends and start training for the Rodes City Run. After months of working out, Ford arrived at the 10K’s start line on Saturday morning 25 lbs. lighter and ready race. She powered through the over six mile course, until reaching mile four, when she started to have trouble breathing. At that point, a car pulled up alongside her. “I’m not going to let her quit, so I got out and she immediately grabbed my hand,” Lt. Aubrey Gregory said. Seeing that Ford was in need of help, Lt. Gregory stopped his car and offered to drive Ford to the finish line. 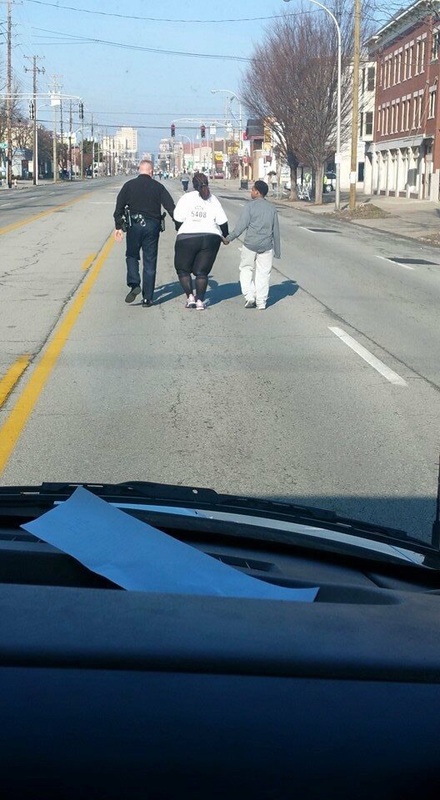 So the officer joined in, walking hand-in-hand with Ford and her son for the rest of the race. The trio completed the remaining two miles together, sharing stories as they moved towards the finish line. As they made the final steps, the crowd congregated at the end of the race burst in to cheers. The moment not only touched Ford and Lt. Gregory, but thousands of others who heard their story. Inspired by this touching moment, Louisville Mayor Greg Fischer posted two shots of the pair crossing the finish line on his Facebook, these photos have now been shared over 3,000 times. Lt. Gregory’s simple act of kindness and support moved Ford most of all. After completing the race, she posted a special message about the police officer on her Facebook along with thanks to the countless people who have reached out to her after hearing about her uplifting finish. “It was really a special moment,” Ford said of her interaction with Lt. Gregory.